Beautiful fabrics for home decorating, draperies, upholstery, and bedding. Many of our fabrics are also suitable for apparel, especially outerwear. Most are at least 54" wide giving you more fabric to use! 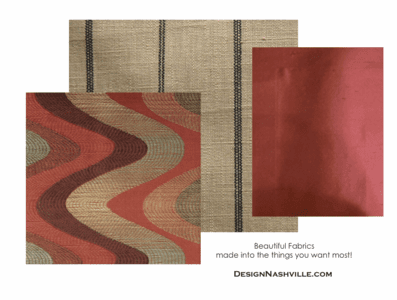 Email Design Nashville for quotes of custom items such as drapery panels, ripple fold draperies, swag treatments, upholstered headboards, duvet covers, comforters, and roman shades. When you order a fabric, we will find (at your request) coordinates for your project free of charge!